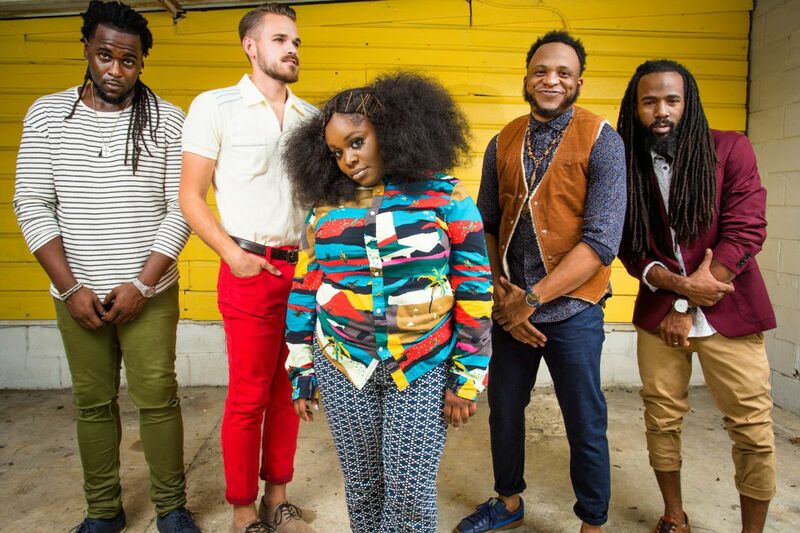 Tank & the Bangas will play the Xponential Music Festival at Wiggins Park in Camden in July. The lineup for the Wiggins Park portion of this summer's XPoNential Music Festival in Camden has been announced, with singer-songwriter Josh Ritter, country breakout star Margo Price, New Orleans party starters Tank & the Bangas and Afrobeat scion Femi Kuti among the notable acts. The WXPN-FM (88.5) presented annual festival will happen on the Camden waterfront from July 27 to July 29, with the marquee headliners at the capacious BB&T Pavilion previously announced: David Byrne and Sylvan Esso on Friday the 27th and The War On Drugs and Sturgill Simpson on Saturday the 28th. The names announced today will take the stages in the more intimate, roofless Wiggins Park, performing on alternating stages that will see lineups run throughout the day. There's no huge names, but lot of mid-sized enticing ones. Femi Kuti, with his dancers, will play the Xponential Music Festival at Wiggins Park in Camden in July. Among them: Bermuda Triangle, the trio featuring Brittany Howard of the Alabama Shakes and songwriters Becca Mancari and Jesse Lasfer; Oklahoma 1950s style wild eyed rock JD McPherson; folk trio The Lone Bellow; heart piercing singer-songwriter Phoebe Bridgers; Willie Nelson's son Lukas Nelson with his rock band Promise of the Real; Brooklyn indie band Sunflower Bean; Hiss Golden Messenger, the Dylany band fronted by North Carolina songsmith MC Taylor; Los Angeles NPR darlings Lo Moon; and Jupiter & Okwess, the vibrant dance band from the Democratic Republic of the Congo fronted by Jupiter Bokondji. There are Philly bands, and locally connected ones, also on the bill. They include jangle-pop wonders Hurry, Philly born and L.A. based folk-pop band Mt. Joy, also Cali residing rising "Shine" rocker Mondo Cozmo and Nashville based Delaware County native soul man Devon Gilfillian. Expect another handful of acts to me announced in the coming months. Three day passes which gets fans into Wiggins Park and two night on the BB&T lawn go on sale today at 10 a.m. xpnfest.org/#tickets.